I probably shouldn't publicly confess this but the design for this card came to me while I was in church last week! Egads! I worked quickly to get my mind back on track but headed straight to the craft room when we got home so I could make my card before I forgot the design idea. I wanted to stay with a pure white background, with just a hint of color. Having two boys, I went with a pale aqua but this design would work great with pink or yellow too. I dry embossed the background pieces as well as the circle. I then stamped the baby image on white, colored it with Copics, and cut it out to mount with foam tape on to the embossed circle. I then cut out a few of the stars to place them around the baby. 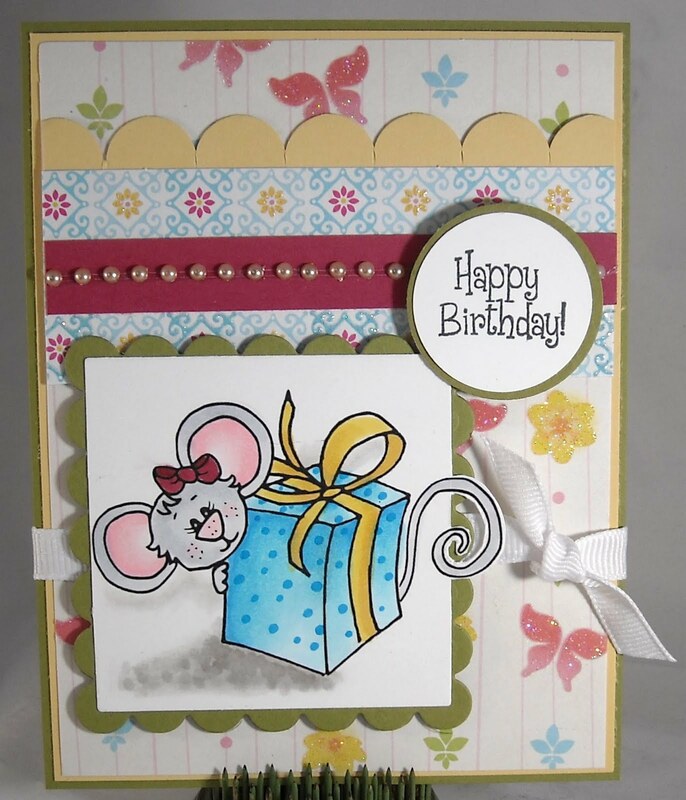 I only added a few rhinestones, the sentiment, die cute square, and ribbon to finish the card. 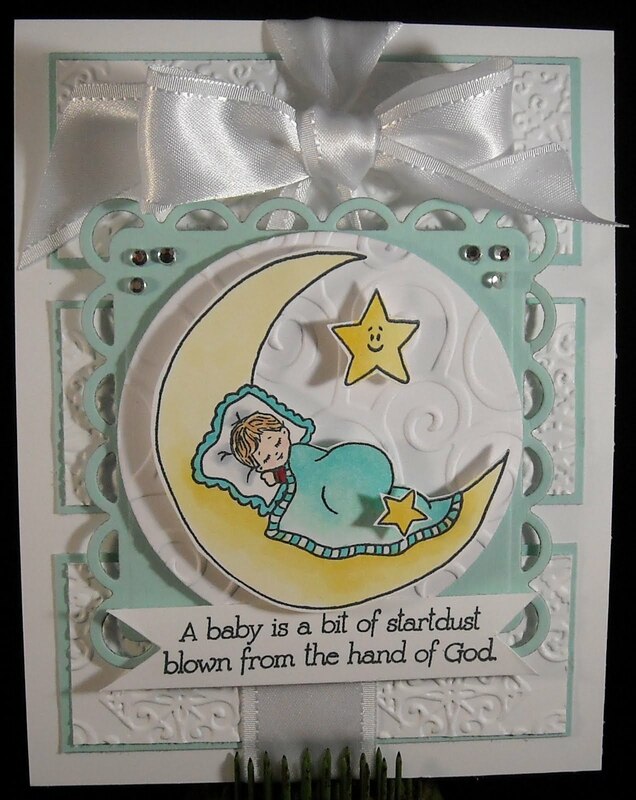 Be sure to check out the other designers creations by visiting the Sweet 'n Sassy stamp blog! Welcome to today's Sweet 'n Sassy sneak peek!! Have you been following along this week while Korin and the team have been showcasing the soon-to-be-released stamp sets? If not, be sure to click on over to some of the other team's blogs; links on the left. I am super-duper excited about this month's release! There is so much to choose from and such a wide variety of styles and designs. There really is something for every design style at Sweet 'n Sassy! My card is showing off what is sure to be a favorite stamp set; Wildflowers. I adore the sketched look of the image; how it almost looks like something that has been hand drawn (ok, in reality it has been hand drawn, just not by me!) right on to my card. And I love the solid image design, perfect for those sunset image cards, one of which I'll be sharing later in the week. To create my card, I stamped the image once in Crushed Olive Distress Ink and then stamped it again on top of pre-cut squares (I started with six squares). The second time I stamped the image, I used the rock 'n roll technique to add a bit of orange to the edges of the flowers. I opted to use only four of the squares, which are attached with foam tape, so that you could see both images. It's a little like the spotlight technique, only with more color and areas spotlighted. No embellies for this card, I wanted this pretty image to be front and center! I simply added one of the sentiments, stamped in black, to the bottom corner, slightly overlapping the flower stamp. Be sure to continue checking back on the SNSS stamp blog and the other DT blogs for many more sneak peeks! I'll be back on Friday with another peek at a new set!! I've been a long time stalker of the Hero Arts blog; the artwork found on their blog is always beautiful. The design team and other stampers that they highlight on the blog always come up with the most interesting designs that are generally CAS (clean and simple) in design. Since our store carries Hero Arts, it's fun to go to the blog to see what has been created with the images that we carry and I'm never disappointed! I'm usually amazed at what they create! A few weeks ago I found a blog post that talked about a monthly contest that they hold and this month I decided to participate; using a sketch that they posted as part of the challenge. Since I only own a few Hero Arts stamps, I had to be creative! The leaf image is from an older stamp set, the name of which I no longer have (sorry! ), although in checking out their new catalog they do have a number of leaf stamps that are very similar in style. I created a green shade of paper by using Distress Ink and then I stamped the leaf image three times in VersaMark ink on the green paper. I then embossed the images with gold embossing powder. I then just followed the sketch to create the card. The designer paper at the bottom is from Jillibean Soup, the button is from Tim Holtz, and the sentiment is from Sweet 'n Sassy. If you're interested in the Hero Arts contest, you can check out the details here. Hey, hey, it's release day! Sweet 'n Sassy is releasing some new digis today, so here to check them out! For my card, I thought I'd use a previously released image on a card today...something I'd like to try doing on a weekly basis, so we don't forget about all those other fabulous SNSS stamps!! 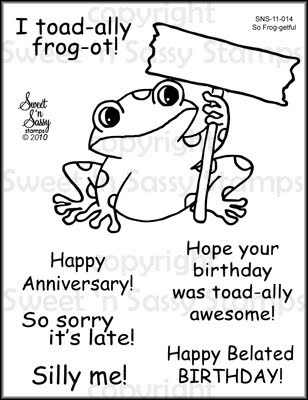 :-) The image is from the Little Boy Toys stamp set, which includes four sweet boy-themed images and five sentiments. 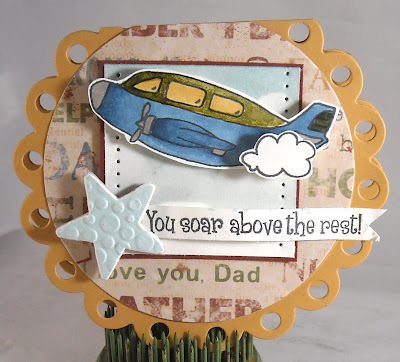 I thought I'd create a card that could work for Father's Day and I used a Nestibilities to create the card itself and then layered a cloud background (created with a template, ink, and sponge) and the airplane. The little cloud image is also included with the stamp set and I love the addition of it over the back of the plane. For the sentiment, I inked one word at a time so I could create a long line instead of a block layout, as it was created. The tiny chipboard star I happened to find in my stash when I was looking for something else and I thought it was a great addition! Be sure to stop by the Sweet 'n Sassy web site today to check out the new releases....and the old! I'm super excited about today's project, made using a template from My Time Made Easy. I've been chatting with Lauren about the possibility of me using her templates and stamps in my classes at Wholly Scrap! and she was on board with the idea! 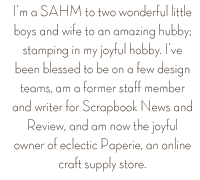 This is so exciting for me as I adore the MTME templates and stamps and think that these projects are going to be a big draw for the store's customers. This is the first project we'll be creating, during out class tonight. This is the Fancy a Cuppa template and is seriously super easy to create and super fun! 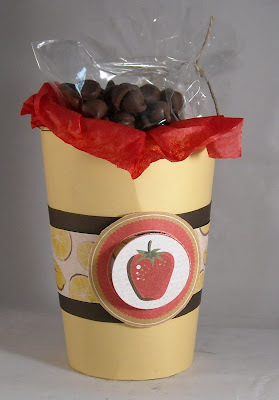 So many ideas for this type of project; perfect for housewarming gifts or a dinner gift. How about baby or bridal showers? 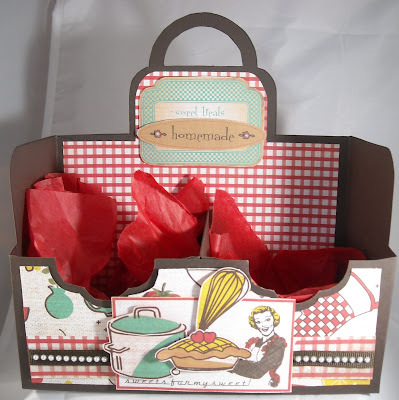 I chose to go with a baking theme so I could dig in to my stash of vintage cooking paper from Kaiser Craft. (Next month I plan on incorporating Lauren's stamps with the template). I adore this paper and the fun retro colors. How about the lady holding the giant pie...too much fun! Since my designer paper had a bunch of baking references I opted to fill my coffee cups with the supplies needed to bake chocolate chip cookies. And if I was giving this as a gift, I would include a coordinating recipe card, which this paper line happens to come with! I didn't even use stamps on the box, just cut out the many images from this darling paper and added a few tiny pearl accents. Easy peasy! Be sure to check out the My Time Made Easy web site for many more ideas! I'll be back early next month with a new project! Hi all! 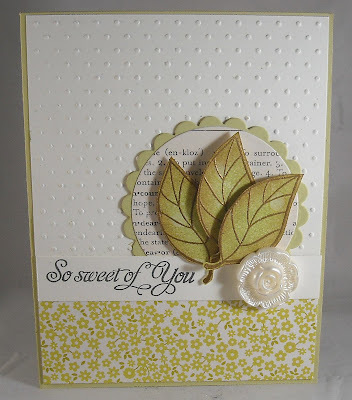 Today I'm sharing a card I created for this week's Sweet Stop sketch challenge. This week's sketch is, in a word, fabulous! What a great way to showcase a variety of designer papers and images. I have a feeling that I'll be using this sketch again and again. This week's challenge was to not only use the sketch but to include "winged things." 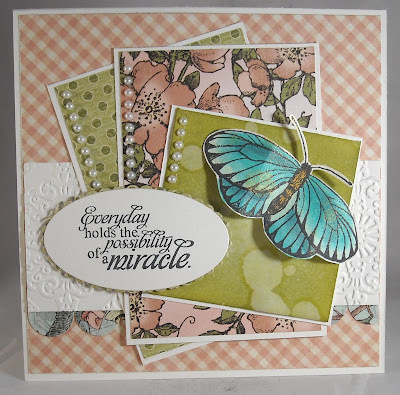 Of course when I saw the challenge, I immediately thought of one of my all time favorite Sweet 'n Sassy images, the butterflies from the Everyday Miracles stamp set. The paper I used on my card is from Graphic 45, such a great line and perfect to showcase this beautiful butterfly image. I colored the butterfly with Copics and then misted it with gold shimmer mist, which you can just see a hint of in the photo. The background behind the butterfly was created with Distress Inks, a blending tool, and a spritz of water. Enjoy today's card and be sure to check out the Sweet Stop challenge...prizes could be involved! 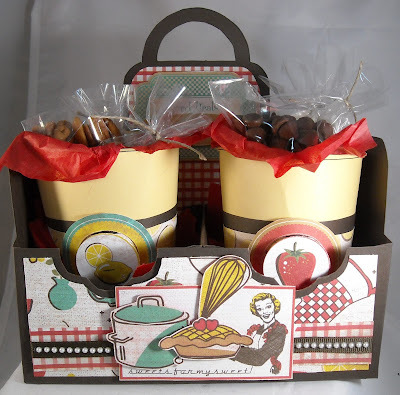 Welcome to the April Sweet 'n Sassy Customer Blog Hop! (It's also digi release day at SNSS so be sure to stop by the web site to see all of the newly released images). You can read all about the blog hop details here, be sure to check it out because there are prizes involved!! Oh, and I should add that this is a blog hop that you can participate in...it's for our wonderful customers to join in on the fun! For my card, I used a brand new digi called Cookie's Gift. The image was colored with Copics and paired with this lovely Spring paper from Best Creation. The layout is a loose version of this week's Mojo Monday sketch. Enjoy today's card and enjoy the hop! I participated in a CAS (Clean and Simple) challenge on Splitcoast last week and this was the card I submitted. This lovely tulip image is a recent Sweet 'n Sassy release, called Spring Tulips. The SCS challenge was a color challenge; pale aqua and yellow. I used these colors in my coloring (with Copics) and in the layered cardstock. A white satin ribbon was my only extra! Enjoy! A quick card from my Wholly Scrap! class last week. This is a technique called emerging color and the looks is achieved the following way: 1) Use solid image stamps for this technique 2) Collage stamp three-four images, in different color inks, all over a white or cream piece of cardstock 3) Allow to fully dry to use an embossing buddy to remove any static, stamp larger solid image in VersaMark and emboss with clear embossing powder 4) Use a brayer and dark ink (I used black on my card) to fully cover the white/cream cardstock. The embossed images will resist the ink. 5) Once the white/cream cardstock is fully covered, use a clean cloth to remove any ink residue from the embossed images. And there you have it! This is a great technique for large floral (or in my case leave) images! All stamps are from Tim Holtz and supplies are from Wholly Scrap! Enjoy your Monday! PS - I have a plea for help!! Blogger will not keep my spacing in my posts, no matter what I do everything gets all bunched up when I publish...even if the preview appears correctly. Anyone have any ideas?? Happy Friday! I'm so excited for the weekend this week...it's been a busy week and I'm looking forward to not thinking about my marketing consulting work and getting to fully enjoy a few hours of stamping tonight at my monthly Wholly Scrap! class! This month we'll be making this sweet Easter-themed box/basket out of chipboard coasters. I love how easy it is to create these sweet boxes. Perfect for a baby or wedding shower, or even table decorations! My coasters are covered with bright, Springy paper from Imaginsce. I used a Crop-a-dile to punch the holes in the chipboard and this fun purple ribbon to hold all of the pieces together. I also added a chipboard bottom to the box so that I can fill it with candy! This sweet bunny and egg stamp is from The Paper Company. Enjoy your weekend! Greetings and welcome to this month's Tiffany Doodles challenge! This is your opportunity to participate in a fun challenge and be entered in to a drawing for wonderful prizes! Our challenges last for two weeks so you have plenty of time to create and post! For April, the challenge was to create a card based on a color inspiration, turquoise, which you can see in the Tiffany Doodles graphic below. For my card I used the 2 Butterflies image, which is available for immediate download for only $2.50! I colored my image with Copic markers and adhered them with foam tape to my a stamped doile image (from Papertreyink). The sentiment is from Sweet 'n Sassy and the designer paper is from Little Yellow Bicycle. So...how about the rules for the challenge! The dates! Start date: Today, April 7 End date: April 21, Midnight EST Winners Announced: April 21 Don't forget to add your card to the Tiffany Doodles Flickr Gallery! Tagged with: TD10 The Prizes! 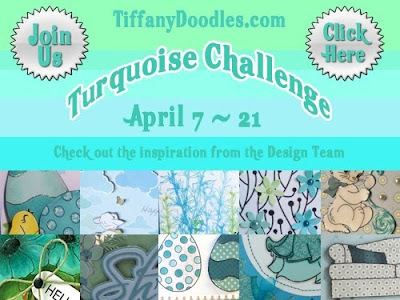 You have two chances to win Tiffany Doodles gift certificates! 1st place - $10.00 gift certificate (Note that you must use a Tiffany Doodles digi image in order to qualify for this prize) 2nd place - $5.00 gift certificate (This prize will go participants who do not use a Tiffany Doodles digi image) Want to see what the rest of the team came up with? You're in for a treat, their designs are amazing! For details on any of the team cards just click on their name on the left hand side of my blog, under the Tiffany Doodles logo, to visit their blogs! Hey, guess what day it is? Yes, yes, it's April 5th but guess what else today is? It's Korin's birthday!! And a bunch of us are hosting a surprise blog hop to celebrate Korin's special day!! WooHoo!! (I think there might even be some prizes in store so be sure to visit everyone's blog!) 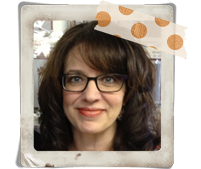 For those of you who might not know, Korin is the owner and illustrator of Sweet 'n Sassy stamps and she is one sweet lady! I had the pleasure of meeting, and stamping, with Korin about two years ago at a Stamping Around event. Not only is she so full of energy and life, but she instantly puts you at ease and you feel as if you've been friends forever. And now I have the blessing of working on her design team, which is just about the best team out there!! How about a scrapbook page for this week's KSS project? Yippee! This is my first February page and it features a photo of a big 'ol playdough snowman that was created by my youngest. This was part of one of his pre-school projects that focused on counting. It was a great winter project and I snapped a few great photos of the kids building. I'm hoping to scrapbook those photos this week. So...what's so simple about this page? I only added a few squares of designer paper - all scraps - from My Minds Eye (Be Loved) to a piece of plain 12x12 cardstock. Easy peasy! A few buttons, rub-ons, and paper ribbon were the finishing touches! Enjoy! It's release day at Sweet 'n Sassy and today they're releasing not one, not two, but EIGHT new stamp sets!! WooHoo!! And not only is Korin offering 15% off the entire release bundle but she's also offering a FREE stamp set when customers spend $33.00 in the entire month of April! You can see the free stamp set below - adorable!! For my card, I used the brand new and oh so cute Babies' Circus set. To create the sentiment background, I laid out all of the sentiments included with the set and then placed my acrylic block on top of the stamps. Now I have a custom stamp! Then I can easily stamp the sentiments all over the background...fun, huh? My sweet teddy bear is stamped and colored with Copics before being added to a piece of yellow cardstock. A piece of blue ribbon was the finishing touch! Check out the free stamp set below, which you will receive for spending just $33 in the month of April, and be sure to head over to the Sweet 'n Sassy web site to see all of the new sets! !